Super7 has lots in store over the coming weeks! We start off this weekend with the return of Ooze Bat, the Snakes of Infinity Slime Creature by Chanmen of Gargamel. This clear blue fight figure is highlighted with purple, red, blue and silver accents. Blooze Bat will be available Sat April 24th, 11am Pacific at the Super7 Store and select distro stores. On May 1st, its a double header release! The Pink Haze Big Sal joins the Monster Family, cast in pearlescent clear vinyl with pink spray fade, and light blue eyes and tentacle stripes. Don't let its beauty stun you for too long, as this figure is only available at Super7 and S7FL, and may fade away before your very eyes. Fast on the heels of the Pink Haze Big Sal is the return of Super7's loveable mascot, Mummy Boy! 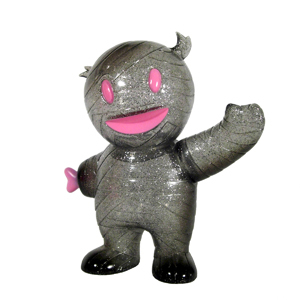 Mummy Boy is cast in smoke grey maximum glitter vinyl with black spray and a huge pink grin, and will be available at S7, S7FL, Rotofugi, 5 & A Dime, Mishka NYC, Red Hot Robot, Ultra Pop, Artoyz, and Neon Monster. Both Big Sal and Mummy Boy will be available at 11am Pacific, May 1st.